Vancouver, British Columbia--(Newsfile Corp. - November 9, 2018) - Bayhorse Silver Inc, (TSXV: BHS) (The "Company" or "Bayhorse") reports that it has filed on SEDAR a National Instrument 43-101 Technical Report (the "Report") on a Maiden Inferred Mineral Resource for the 100% controlled Bayhorse Silver Mine, Oregon, USA. 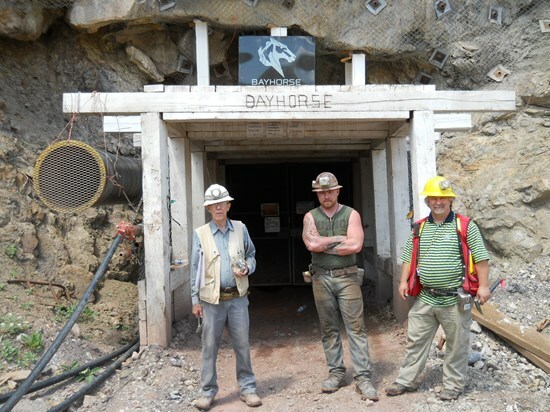 Bayhorse Silver CEO Graeme O'Neill comments: "Filing of this report for the Bayhorse Silver Mine completes another step revealing the resource and exploration potential of this high grade silver mine. We have reached this point with an investment of only $1 per ounce of inferred silver resource, a testimony to the diligence of all personnel involved." The Report outlines the parameters used in the estimation of the maiden inferred mineral resource, that is comprised of 292,300 short tons at an average grade of 21.65 troy ounces per ton (opt) silver (Ag) at a cutoff of 7.5 opt Ag, for a total of 6,328,400 oz silver, dated September 24, 2018, as previously disclosed (BHS2018-30. )The Report was prepared by APEX Geoscience Ltd. and Dr. Gerry Ray, P.Geol. The report is available on both SEDAR, and the Company website at Bayhorse Silver Technical Reports. APEX Geoscience Ltd., used a silver cut-off grade of 7.5 opt Ag, based upon a conceptual overall mining and processing cost of $US100 per ton, a silver price of US$15/oz at US$/C$ Exchange rate of 0.7624/1.3117 and an assumed recovery of 90%. Inferred mineral resources are not mineral reserves. Mineral resources, which are not mineral reserves, do not have demonstrated economic viability. There has been insufficient exploration to allow for the classification of the inferred resources tabulated as an indicated or measured mineral resource, however, it is expected that the majority of the inferred mineral resources could be upgraded to indicated mineral resources with continued exploration. There is no guarantee that any part of these mineral resources will be converted into a mineral reserve in the future. Estimates of mineral resources may be affected by environmental, permitting, legal, marketing or other relevant issues.